MARIO RITTER: Salsa is a house cat. She belongs to Chris Condetti. We asked Chris what Salsa means to his family. 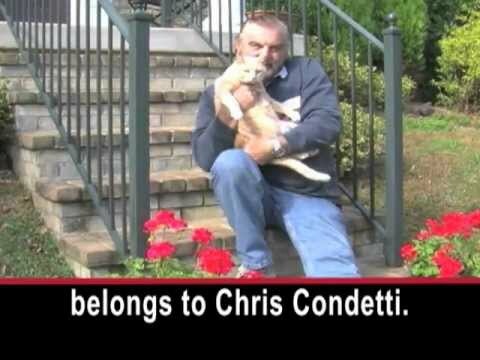 CHRIS CONDETTI: "She is part of the family. She's always with us." MARIO RITTER: Many people treat their pets like family members. Americans spend large amounts of money on health care for pets. They spent $13 billion on veterinary care in 2010. But the health of animals also has a big influence on medical care for people. At the University of Missouri, Doctor Kim Selting recently completed a study on cancer in cats. DOCTOR KIM SELTING: "I think the value of what happens for the health of a pet and how it might translate to human health has come very much to the forefront." MARIO RITTER: Veterinarians study information about animal health from across the United States. At the National Institutes of Health, or NIH, Doctor Chand Khanna tests new cancer drugs for dogs. He says those tests may help people with cancer. DOCTOR CHAND KHANNA: "For the most part, almost every human cancer that occurs, occurs in the dog." MARIO RITTER: Veterinarians can do many of the same tests on dogs and cats that doctors can do on human patients. Doctor Khanna says bone cancer develops in the same way in dogs and humans. DOCTOR CHAND KHANNA: "We've looked at molecular profiles of dog osteosarcoma and human osteosarcoma and we really can't distinguish the dog and the human." MARIO RITTER: And, both species react to drugs. DOCTOR CHAND KHANNA: "Our focus has really been on therapy, really trying to understand how and why drugs that are intended for human use, how we can make them better through their evaluation in dogs with cancer. That's our focus." MARIO RITTER: The research provides better care for pets. Treating animals helps researchers learn much more about cancers in a shorter period of time. DOCTOR KIM SELTING: "They age more rapidly. Their cancers progress more rapidly. We can get answers to whether or not something works much more quickly than you could in a human trial." MARIO RITTER: Veterinarians say they are now able to exchange information with human-cancer specialists to explore what causes cancers and the best ways to treat them. I'm Mario Ritter. Смотрите видео Treating Cancer in Cats and Dogs и вы легко изучите английский язык.